Arwind Santos had the last laugh against the TNT KaTropa as his San Miguel Beermen went on to advance to the semis of the 2019 PBA Philippine Cup after beating their opponent 96-86 in Game 3 of their quarter-finals affair. Santos struggled offensively, but leaned on a different weapon to leave his imprint on the basketball game: in-game trash-talking and taunting. And the mind games of the former PBA MVP seemed to have paid off, frustrating the KaTropa. Santos even drew a foul off Kelly Williams in the third frame with the Beermen comfortably up, 64-40, when Williams body-slammed Santos onto the Smart-Araneta Coliseum floor. Replay showed Santos locking Williams’ left arm, and the latter wanted none of Santos’ antics. “Ginawa ko ‘yung part ko sa depensa tapos pambubully, asaran hanggang sa dulo,” Santos said afterwards, as per ESPN5’s Lyn Olavario. The perennial Defensive Team member bared he was even approached by Jayson Castro to tell him to stop, but Santos remained firm and got the best out of the Beermen’s rivals. “Kasalanan nila yun. Part ng game ‘yub e. Sila ang napikon eh. Marami kaming mga English … marami akong nasasabi. Part of the game lang ‘yun kasi gusto naming manalo talaga,” Santos reiterated. 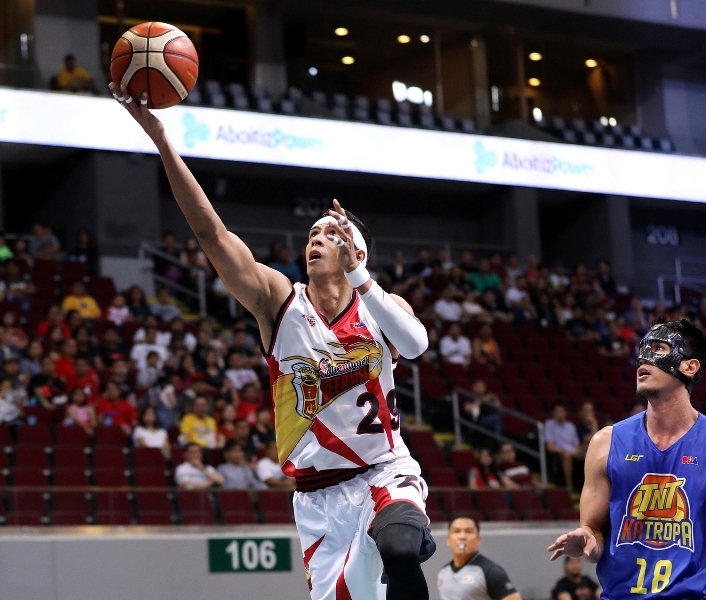 San Miguel kept the door open for a historic fifth straight all-Filipino championship as they look to continue defending the crown next against the Phoenix Fuel Masters in the semis.